If you like Philosophy shower gels, here is a deal to check out. 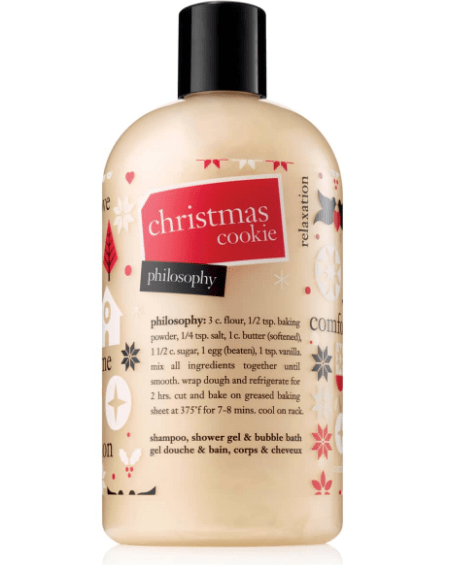 Nordstrom is offering this Philosophy Shower Gels Christmas Cookie for $9! Plus it ships for free! Aqua/Water/Eau, Sodium Laureth Sulfate, Ppg-2 Hydroxyethyl Cocamide, Lauryl Betaine, Acrylates Copolymer, Glycerin, Glycol Distearate, Disodium Laureth Sulfosuccinate, Parfum/Fragrance, Sodium Chloride, Phenoxyethanol, Sodium Benzoate, Citric Acid, Polyquaternium-7, Sodium Hydroxide, Laureth-2, Buteth-3, Sodium Sulfate, Disodium Edta, Maltodextrin, Sodium Benzotriazolyl Butylphenol Sulfonate, Bht, Aloe Barbadensis Leaf Juice, Benzoic Acid, Panthenol, Camellia Sinensis Leaf Extract, Sodium Sulfite, Tributyl Citrate, Polysorbate 20, Caprylyl Glycol, Potassium Sorbate, Hexylene Glycol, Caramel, Fd&C Yellow No. 5 (Ci 19140), Fd&C Red No. 4 (Ci 14700), D&C Green No. 5 (Ci 61570).